Another trilogy done and dusted. While some of the third installments have proved to be the worst of the lot, this surely isn't the case with The Bourne Ultimatum. This is pretty much the best of the lot, and as promised, it goes out with a bang. A bang bigger than the 'Big Bang' itself. After being recovered from the sea, and after losing the one he loves, Jason Bourne (Matt Damon) is one more step closer to finding out how David Webb became Jason Bourne. Whilst Pamela Landy (Joan Allen) has decided to leave Bourne alone, CIA Deputy Director Noah Vosen (David Strathairn) has other plans. He believes that Bourne is still dangerous and must be eliminated, before he finds out his true identity and takes the CIA down with him. 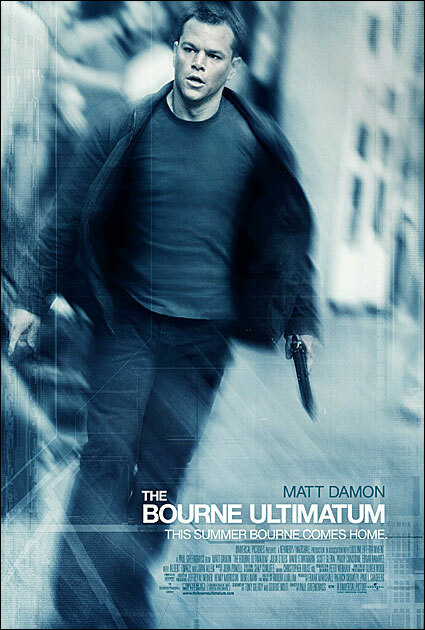 The Bourne Ultimatum does follow the same tradition as the first two: a full on action with lots of chases and guns, but still manages to be intelligent. However, this movie is by far the most satisfying as now most of our questions have been answered about Bourne and his identity. In the most wonderful kind of way. The movie folds together, but the end sees it unfold again, leaving the audience to ponder the future of Jason Bourne. Matt Damon has taken the role of Bourne and created him into something that even James Bond would be jealous of. Unlike most action thrillers, this has a strong emotional connection and a surprising way of executing a very intelligent storyline. Paul Greengrass's direction does get to be a pain though, as the hand held camera work is just a little too low-budget feel for what is supposed to be one of the better blockbusters. Verdict on the trilogy? A fantastic set of action films that will get adrenaline junkies and the like pretty excited. Matt Damon makes these films worth the watch with his on-screen appearance and amazing performances. Total must see for the action fans. The Bourne Ultimatum is the strongest out of the trilogy, I just can't give it the full quota of stars because it isn't typically my thing.